Home > Forming Plastics | Manufacturing | Medical Devices | Plastics | Radomes | Thermoforming > Did You Know This About Thermoforming? Did You Know This About Thermoforming? Did you realize that thermoforming is a crucial industry for many different types of companies from medical device companies to aerospace companies and more? Here’s why. Thermoformers produce plastic products that are either created through thin-gauge or thick-gauge thermoforming. Thermoforming is a process that essentially uses a sheet of heated plastic which then becomes pliable and can be placed in a mold, trimmed, and cooled. Thin-gauge thermoformed parts measure in at around 0.5mm in thickness. They are used for thousands of products including plastic packaging for toys, batteries, those blister packs that we all love to hate, and an entire range of trays that hold everything from medical products to cookies. 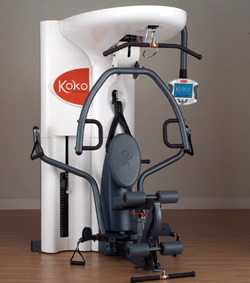 that is the mainstay of Koko Fit Clubs uses thermoformed plastic parts and enclosures. Fortunately, many thermoforming companies use post-consumer materials as well as plastics that are biodegradable or recyclable because they are aware of the impact plastic can have on the environment. Thermoforming is an in-demand plastic forming process because it offers strength, light weight, and the capacity to produce elegant looking plastic parts that are appealing to the equipment manufacturer because of the exquisite finishes that impressthe end user.